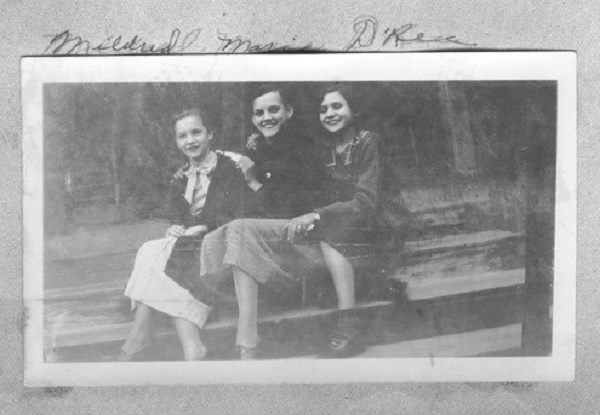 In the 1930s D’Ree Yawn was a teenage girl living in Ray City, GA, photographed here with Mildred Clements, and another friend, Marie. Three young friends in Ray City. Left to right: Mildred Clements, Marie ?, and D’Ree Yawn. Image courtesy of Debra Klein. D’Ree Yawn and Mildred Clements were friends and neighbors. Mildred lived in the home on the northeast corner of Jones Street and Pauline Street; her parents were Hod Clements and Alma Florence May. D’Ree was a daughter of Vera Laura Roberts and Clayton Samuel Yawn. She was the sister of Allene Yawn and Caswell Yawn. In the 1920s D’Ree Yawn lived with her parents in the residence of her great uncle James Studstill. The Studstill home was located half-a-block down Jones Street, on a large lot on the southwest corner of Jones and Bishop Street. Some time in the 1930s D’Ree’s family moved up Jones Street to a house directly across Pauline Street from the Clements house. This house still stands, although it has been somewhat remodeled. In the 1930s there was a massive old magnolia tree in the front yard of this house that nearly obscured it from the street. D’Ree Yawn and her family occupied this home in the 1930s. 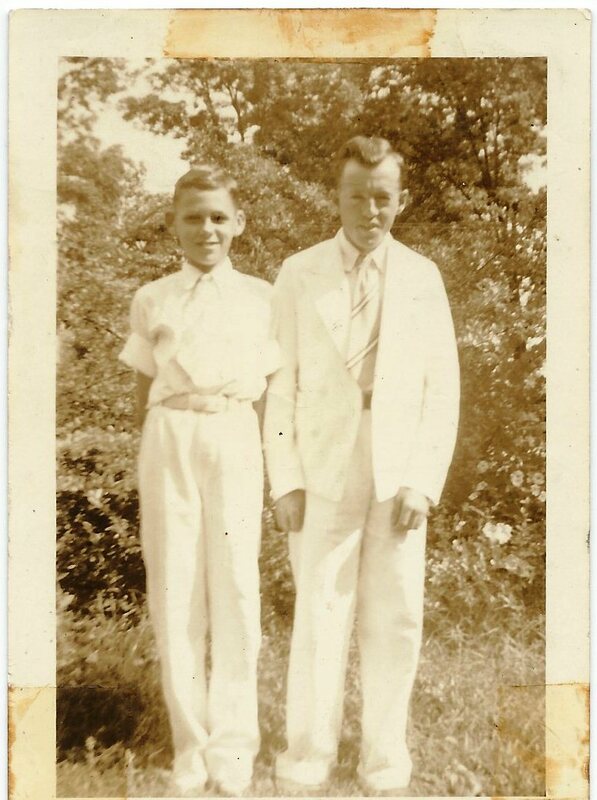 Caswell Yawn (LEFT) and James Clements (RIGHT) photographed June 2, 1939. Image courtesy of Edith Mayo. Caswell S. Yawn, 77, died Saturday, June 21, 2003, at his residence under the care of Pearls of Life Hospice. He was born and reared in Ray City, Georgia, and lived in Jesup many years before moving to Reidsville 30 years ago. He was a U. S. Navy veteran and retired after 25 years of service from Georgia State Prison as an x-ray technologist. He was currently working part time as a lab technologist with Doctor’s Lab in Vidalia. He was a member and a deacon of Reidsville Baptist Church, Past Master of Rising Sun Lodge #32, served on the Board of Directors of the Reidsville Lions Club, and was a member of Reidsville VFW Post #7760. 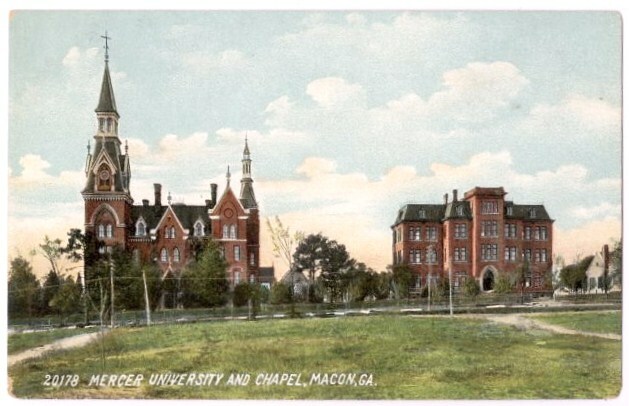 He was preceded in death by his father and mother, Clayton Samuel Yawn of Florence, South Carolina, and Vera Roberts Yawn of Ray City, Georgia. He is survived by his wife, Grace Curl Yawn of Reidsville; two sons and daughters-in-law, Clayton and Ellie Yawn of Green Cove Springs, Florida, and Greg and Susan Yawn of Dacula, Georgia; two stepsons and stepdaughters-in-law, Mike and Kelly Canady of Hagan and Wayne and Tammy Canady of Reidsville; one stepdaughter and stepson-in-law, Teresa and Darrion Stanfield of Reidsville; two sisters, D’Ree Natale of Washingtonville, New York, and Allene Stutzman of Pinehurst, North Carolina; eight grandchildren; and several nieces and nephews. Funeral services were held at 11 a.m. Monday, June 23, at Reidsville Baptist Church. Interment was in Reidsville City Cemetery, with Masonic Burial Rites given. Active pallbearers were Byron Smith, Floyd James, Glenn Williams, Bobby Anderson, Gary Curl, and Neil Rogers. Honorary pallbearers were the E. B. Register Sunday School Class, the Reidsville Lions Club, and Doctor’s Lab in Vidalia. Bradley B. Anderson Funeral Home of Reidsville, Georgia, was in charge of the arrangements. Robert J. 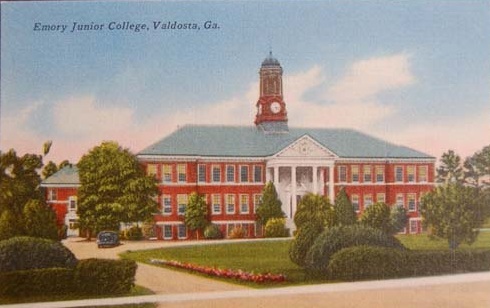 “Bob” Starling, a son of Henry Laverne Starling and Allie Purvis, attended the Emory College campus in Valdosta in 1948. His father was the school lunchroom supervisor at Ray City, and his grandfather, Juniper Griffis Starling, was a pioneer settler of Coffee County, GA.
Bob Starling grew up in his father’s household on Park Street in Ray City, and attended the Ray City School along with his brothers and sisters. The Starling kids were all involved in the Glee Club. 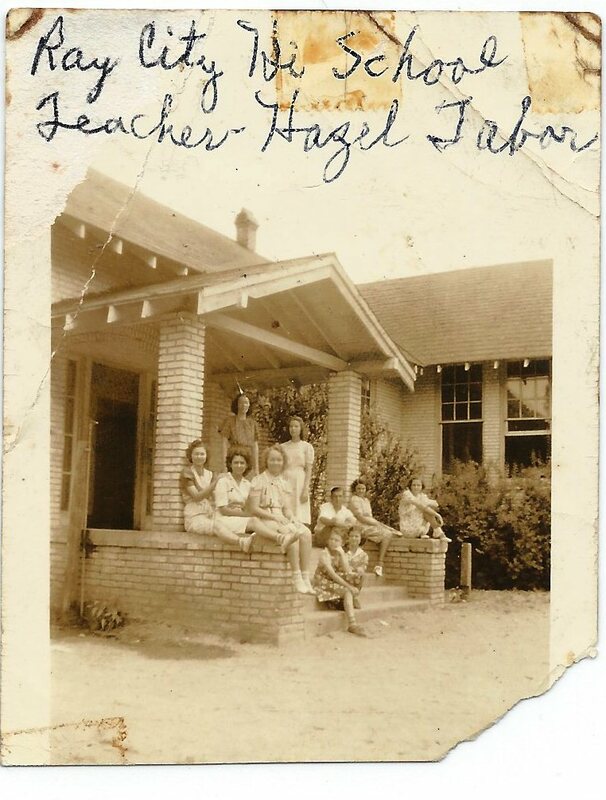 In 1939, Bob and his sister, Wylda Starling, played in the school’s Symphonet Band, along with Lamar Hardy, Fain Guthrie, Ferrell Herring, Barbara Swindle, Annie Martha Grisset, Lois Burkhalter, Kenneth Cameron, Billy Creech, Casswell Yawn, and Sadie Griner. His older siblings, Hubert C Starling and Juanelle Starling sang with the school chorus. 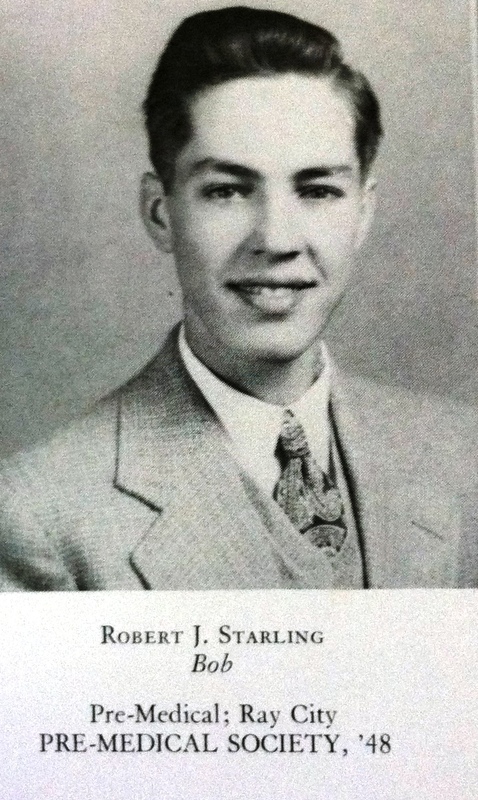 Bob Starling went on to become Dr. Robert J. Starling. He married a nurse, Frances Carolyn Singletary, and practiced medicine in Donalsonville, GA. He eventually purchased the hospital in Donalsonville and he and Frances operated it for many years. Dr Earle Moseley built the facility and it was known as Moseley Clinic and Hospital until his death in 1963. After that time, Dr Bob Starling purchased the hospital and it was renamed “Seminole Memorial Hospital”. Dr Jake Holley came that same year and joined him. Later he was joined by Dr Lewis Chisholm for a while, then later Dr Charlie O Walker. 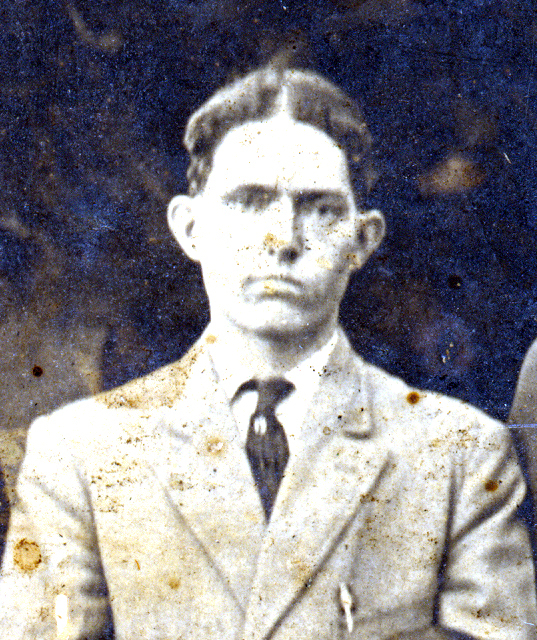 Clayton Samuel Yawn lived in Ray City, GA from about 1918 to about 1935. He was the father of Caswell Yawn, Aline Yawn and D’Ree Yawn, subject of the previous post. He was born and raised in Appling County, and went on to be college educated and trained in the ministry. Some time before 1919 he came to live in Ray City. However, he does not appear in the 1144 Georgia Militia District in the census of 1920. It may have been during this time that Clayton was away at school. 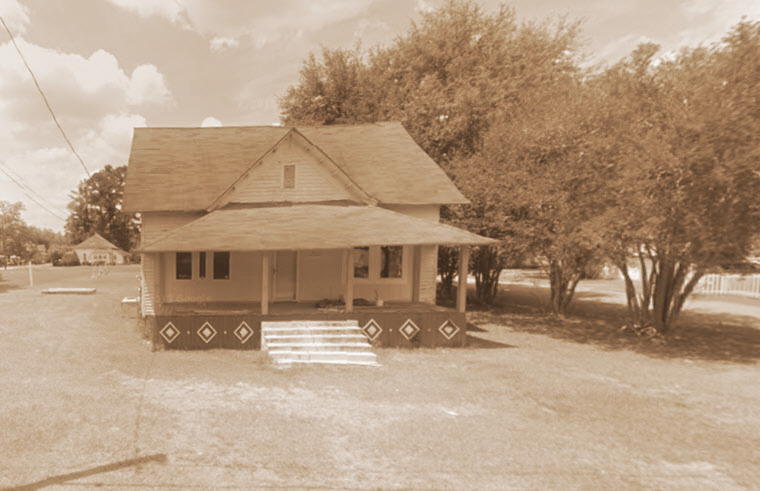 C.S Yawn of Ray City, GA was listed among the ordained ministers of the United States in the 1919 American Baptists Yearbook. Two years before, on June 5, 1917, the Reverend C.S. Yawn registered for the WWI draft in Appling County . The 22 year-old Yawn was described as medium height and build, with grey eyes and black hair. 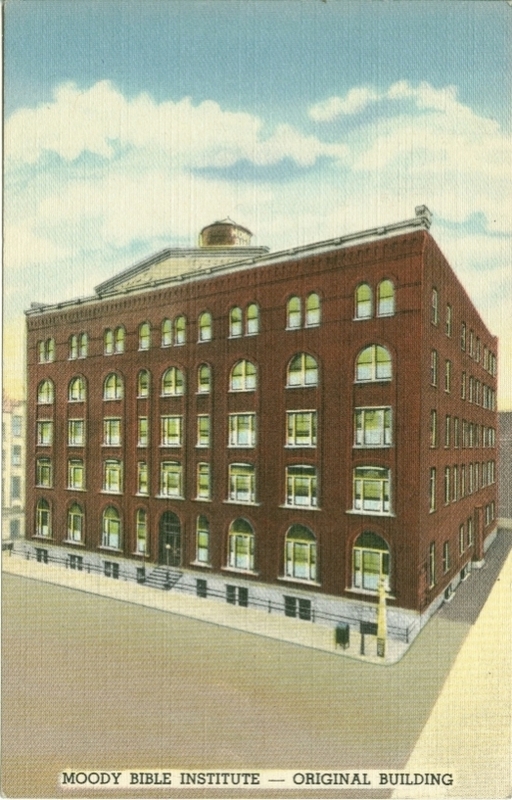 Clayton Samuel Yawn attended the Moody Bible Institute, Chicago, IL in 1918. Clayton Samuel Yawn and Vera Laura Roberts were married about 1921. 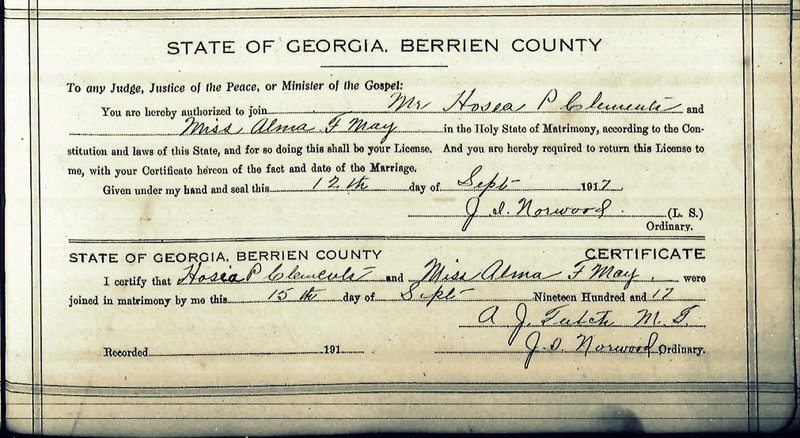 In the 1930 census Vera and Clayton Samuel Yawn were living in Ray City, GA boarding in the household of her uncle James and aunt Mollie Studstill. Clayton Yawn listed his profession as “commercial traveler,” working in the “automobile accessories” industry. Clayton Samuel Yawn died in 1950. Funeral services for the Reverend Clayton S. Yawn, Baptist minister, will be conducted at 3 o’clock Saturday afternoon. Officiating will be the Reverend William L. Faircloth, pastor of the Rosewood Baptist Church of Columbia, and the Reverend Jasper Hinson, pastor of the Holly Hill Baptist Church. Committal services and burial will follow in the family plot of Norway cemetery. Mr. Yawn died Thursday afternoon at Bruce Hospital in Florence [SC]. He had been in failing health for the past year. At the time of his death he was pastor of the Baptist Tabernacle of Ocean Drive. He was a former pastor of the Grace Baptist Tabernacle of Bucksport. He was born at Hazlehurst, Georgia July 25 1895, the son of the late James H. and Lydia Carter Yawn of Baxley, Ga. He had resided in Columbia, Sumter, Florence, Ocean Drive and Norway. He was a member of the Rosewood Baptist church of Columbia, the Lions Club, and the Junior Order. Reverend Yawn was educated at Mercer University, Moody Bible Institute, Chicago, and the Baptist Bible Institute of New Orleans. He is survived by his wife, Mrs. Ann Moss Moore Yawn of Norway; a son, Caswell Yawn of Atlanta, Ga.; two daughters, Misses Deree and Aline Yawn of New York City; a brother, Evan Yawn of Hazlehurst, Ga.; two sisters, Mrs. Edna Sapp and Mrs. Agnes Franklin of Brunswick, Ga.; a nephew,Codis Yawn, of Charleston and two grandchildren survive also. The body of Reverend Yawn was taken from Waters Funeral Home Friday afternoon to the residence of Miss Emma Moss at Norway to remain until the hour of the funeral services. Active bearers will be Joe Cleaton, Henry Price, Frank Cunningham, the Reverenc Keith Gordon, J.W. Hughes, Dr. J. L Bruce, Dr. W. L. Mills, J. H. Price and R. L. Moore. 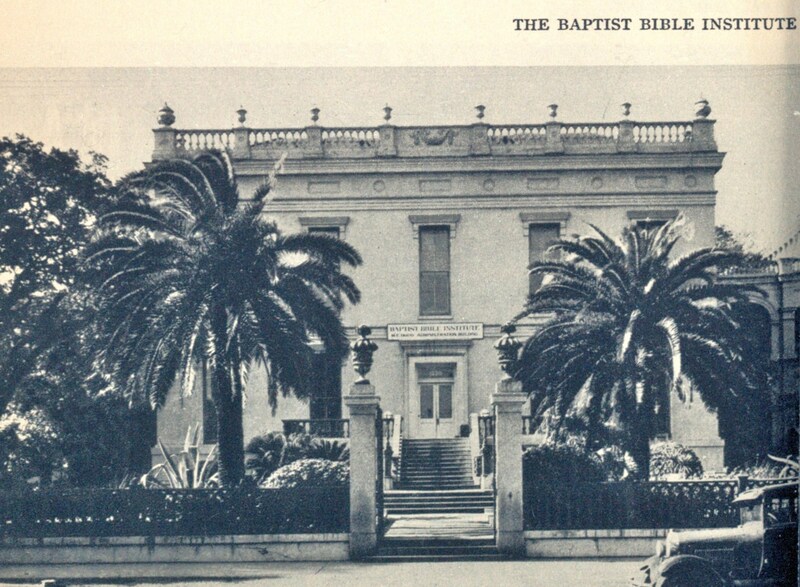 Another Alma Mater of Clayton Samuel Yawn was The Baptist Bible Institute of New Orleans (image circa 1938). Obituary of Clayton Samuel Yawn, 1950, Florence, SC. D’Ree Yawn, about 12 years old. 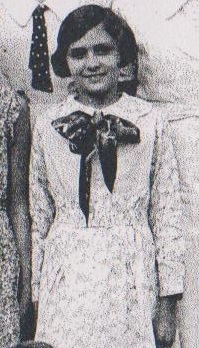 Image detail from 1934 6th grade class photo, Ray City School, Ray City, GA.
Ray City, Ga was the childhood home of D’Ree Yawn Natale, born July 31, 1922. D’ree was a daughter of Vera Laura Roberts. Vera Roberts was a neice of Mollie Clements and James M. Studstill. In 1920, seventeen-year-old Vera was living in her uncle’s household. Her uncle was a deputy sheriff stationed at the sawmill in Ray City. This would have been the Clements sawmill, which was a community of over 300 people in itself. 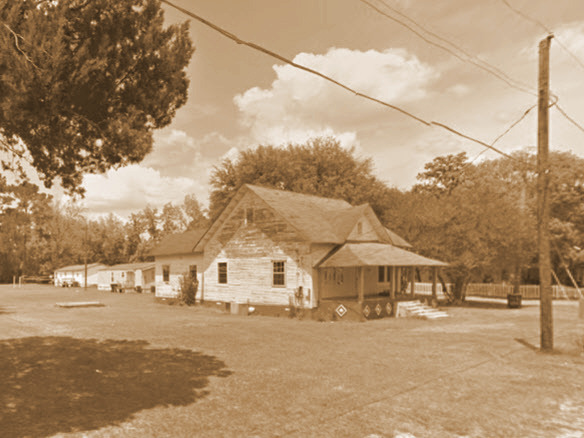 The Studstills had a large old, unpainted house in Ray City that was situated on the southwest corner at the intersection of Bishop Street and Jones Street. The 1920 census lists this house on Jones Street, but the front of the house actually faced Bishop Street. (Later, this home was owned by Pluma Batterbee, and has since been destroyed.) The Studstills also had a a farm out on the northeast side of town. D’Ree’s father was Clayton Samuel Yawn. He was born and raised in Appling County, and went on to be college educated and trained in the ministry. Some time before 1919 he came to live in Ray City. However, he does not appear in the 1144 Georgia Militia District in the census of 1920. It may have been during this time that Clayton was away at school. Clayton Samuel Yawn and Vera Laura Roberts were married about 1921. D’Ree was born the following year. In the 1930 census D’Ree Yawn and her family were living in Ray City, GA still boarding in the household of James and Mollie Studstill. D’Ree’s father, Clayton Yawn, then listed his profession as “commercial traveler” working in the “automobile accessories” industry. Image (right) is detail from the 1934 Ray City School Grade 6 class picture. In 1935, when D’Ree was about thirteen years old, her parents were divorced in Florida. D’Ree continued to live with her mother and siblings in Ray City. D’Ree grew into one of the most attractive young women of Ray City. She, her sisters and mother, were always noted for their fashionable dress, and beautifully done makeup and hair. At age 21, D’Ree Yawn married Michael F. Natale. They were married on April 9, 1944 at St. Peter’s Church, Haverstraw, NY. Thereafter the couple made their home in New York. D’Ree Yawn and Michael F. Natale, April 9, 1944. NATALE, D’REE – D’Ree Natale, formerly of Garnerville, NY, passed away on November 12, 2003, at her home in Washingtonville, NY. She was 81. 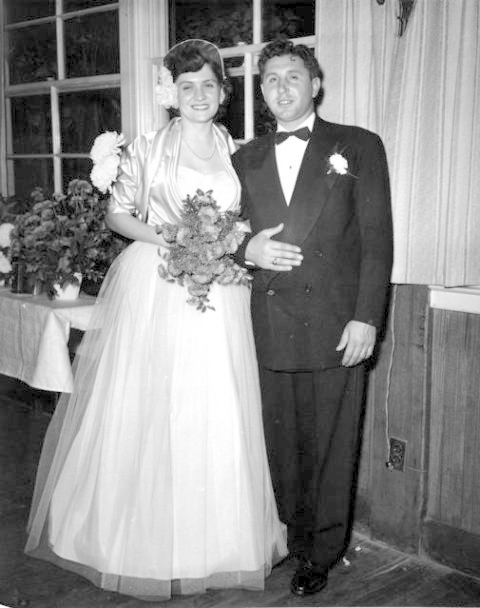 She was the beloved wife of the late Michael F. Natale whom she married on April 9, 1944 and together owned and operated Mike’s Taxi Service in Haverstraw for over 50 years. D’Ree was born on July 31, 1922 in Ray City, Georgia to the late Vera Roberts Yawn and Clayton Samuel Yawn. D’Ree is survived by her four loving children, Michael and wife Lois of West Nyack, Robert and wife Joanne of Washingtonville, Debra and husband Robert Klein of Campbell Hall and Jeffrey of Atlantic Highland, NJ; and a dear sister, Allene Stutzman of Pinehurts, North Carolina; cherished grandchildren Christine, Stephanie, Tiffanie, Dawn, Amy, Robert Jr., Jaimie, Alison, Jason, James and Matthew; and six great-grandchildren, Madison, Branden, Aiden, Gavin, Jackson and Ian along with several nieces and nephews. D’Ree was predeceased by a granddaughter, Lauren, a brother Caswell Yawn and a sister Laura Jean Yawn. Funeral Services were held at the T.J. McGowan Funeral Home in the Village of Haverstraw on Monday, November 17, at 10 AM. Interment followed at St. Mary’s Cemetery, Washingtonville, NY.